Conch Republic Media Group promotes your Florida Keys business through interactive video, social networking and new media. 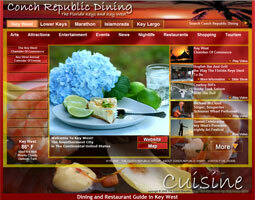 Building on the success of video-based websites like YouTube, The Conch Republic Media Group– launched in 2008 a series of video driven, travel information websites dedicated to promoting quality tourism and businesses in the Florida Keys and Key West. The company’s flagship sites, ConchTV.com, Conch Radio.com and KeysTV.com, provides a unique marketing opportunity for businesses to attract new customers and encourage repeat business. “Consumers are accessing online video now more than ever before. Businesses must think outside the box to stay competitive and utilize innovative marketing methods to connect with their customers,” said Craig Hollenback. “It’s clear from popular websites like YouTube that people enjoy watching videos on their computers and mobile devices. Our websites provide that positive user experience,” said Gail Hollenback. All videos produced by the The Conch Republic Media Group for its’ family of websites are shot in high definition using the latest Sony Cine Alta cameras approved for use by satellite channels like Discovery HD. They are also posted on The Conch Republic Media Group’s You Tube Channel where they are picked up for global web syndication. ConchTV.com, combines travel videos, tourist maps, informational websites, plus printable coupons and brochures from all areas of the Florida Keys. When visitors log on to ConchTV.com they are greeted with a video host who provides an overview of the highlights of travel destinations throughout Key West and The Florida Keys. 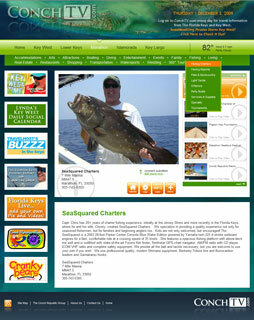 Navigate ConchTV.com based on a specific geographic region–Key West, Big Pine, Marathon, Islamorada or Key Largo—and discover information about restaurants, attractions, accommodations, fishing, watersports, weddings, real estate and much, much more. Both ConchTV.com and KeysTV.com showcase The Florida Keys and Key West as a world class travel destination and is fast becoming the quintessential information hub for locals and tourists alike. ConchRadio.com streams Trop Rock music from The Florida Keys and Key West. 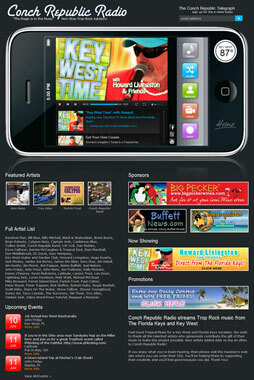 This site is the number one listened to Trop Rock Internet Radio site next to Radio Margaritaville. When was the last time you could listen to tropical music all day long? At Conch Republic Radio, we have one mission: To play your favorite Florida Keys and Key West Trop Rock island songs, promote the extraordinary musicians who celebrate The Conch Republic lifestyle and provide the tropical experience that we know you’ll love. 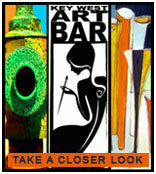 ConchRadio.com features banner advertising opportunities, video and audio commercials, as well as advertising within special programs like ‘Key West Time” with Howard Livingston and friends. 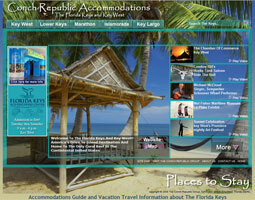 The site is croos linked to ConchTV.com, KeysTV.com as well as all the other Conch Republic Media Group family of websites. 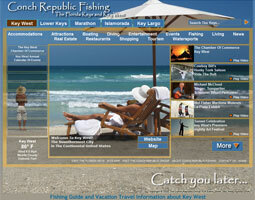 In addition, to the primary sites – www.ConchTV.com www.ConchRadio.com and www.KeysTV.com– the company has rolled out 16 topic specific video websites such as www.ConchRepublicAccommodations.com , www.ConchRepublicDining.com , www.ConchRepublicFishing.com and www.ConchRepublicKids.com and others are being added. The Conch Republic Media Group is the creation of local entrepreneurs Gail and Craig Hollenback who drew from their years of professional experience in graphic design, marketing and corporate video production. The Conch Republic Media Group also provides services in Web Site 2.0 Design and Hosting, Digital Photography, 360 Degree Tours, Electronic Print Production, plus Advertising Opportunities on Internet TV & Internet Radio. For further information about The Conch Republic Media Group, call (305) 293-8685.